River Pollution 1: Chemical Analysis discusses methods of detecting and determining the various forms of pollution and the interpretation of results. It aims to provide a chemical background for, and supplement to, the information on analytical methods, and to review critically other methods which may be useful in certain circumstances for research, control work, and field tests. 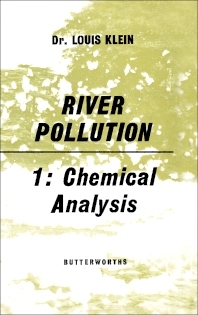 The book begins with a description of river surveys, and physical and chemical methods for determining river pollution. Separate chapters cover methods to determine the presence of dissolved oxygen, combined nitrogen, sulfur compounds, carbon dioxide, free chlorine, metallic contaminants, and carbon compounds. Subsequent chapters discuss the estimation of less important substances which may sometimes be encountered in pollution problems; and the significance of chemical and physical tests and the interpretation of the results of an analysis. This book is intended for those interested in chemical analysis as applied to river pollution problems, sewage, and trade wastes.